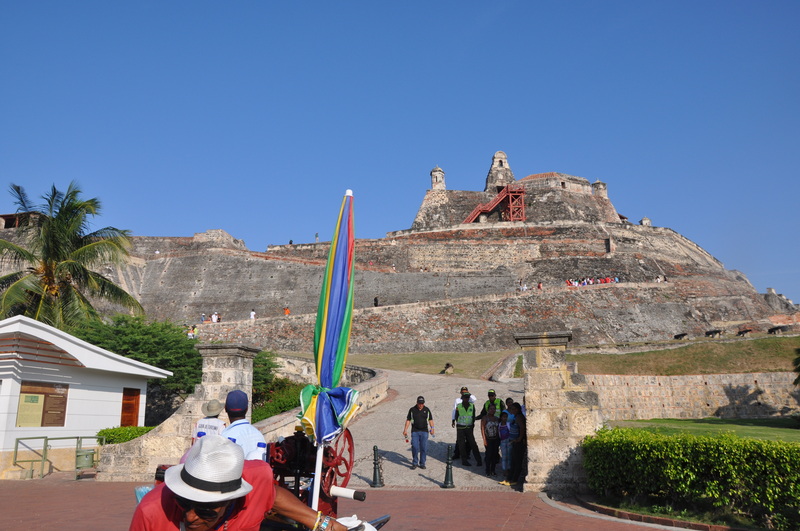 My family and I recently returned from a five-day trip to Cartagena where we went for my brother’s wedding. Although I looked forward to seeing the city, I had no idea we would be in for such a treat. 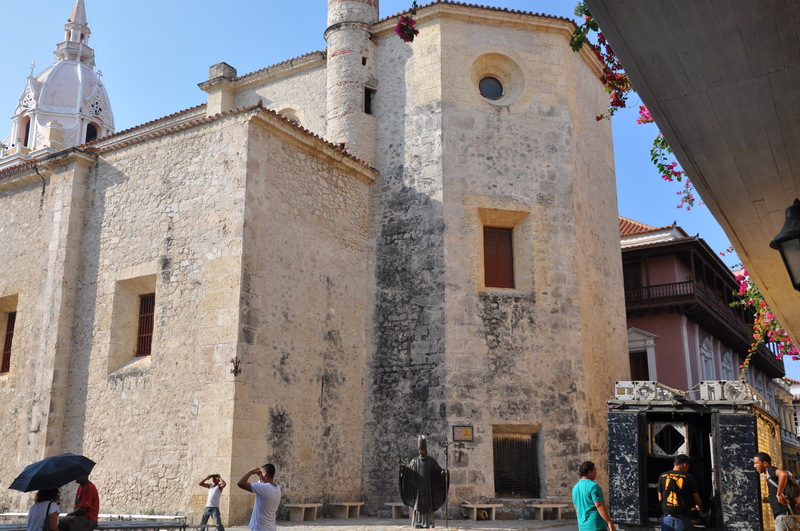 We spent most of our time in the colonial part of the city, which is surrounded by incredibly thick stone walls built by the Spanish in the 16th-18th centuries. The entire city was bursting with color and rich in culture and history. 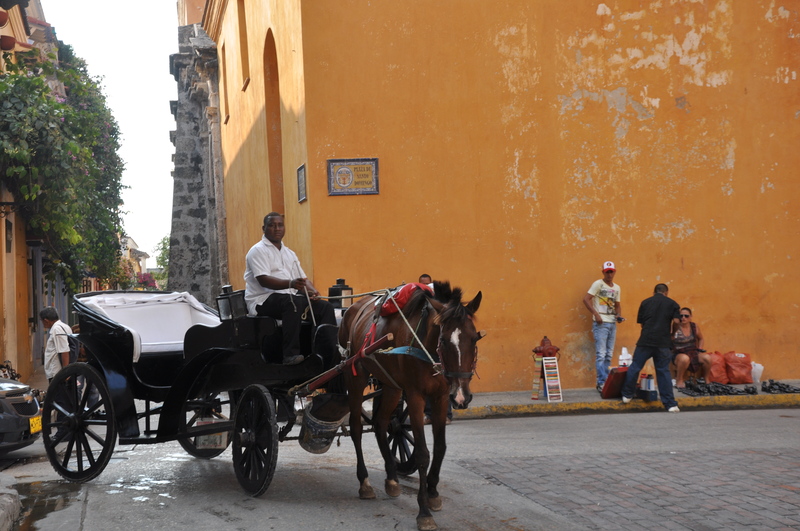 We were amazed by the Spanish influence as we strolled through the picturesque streets. 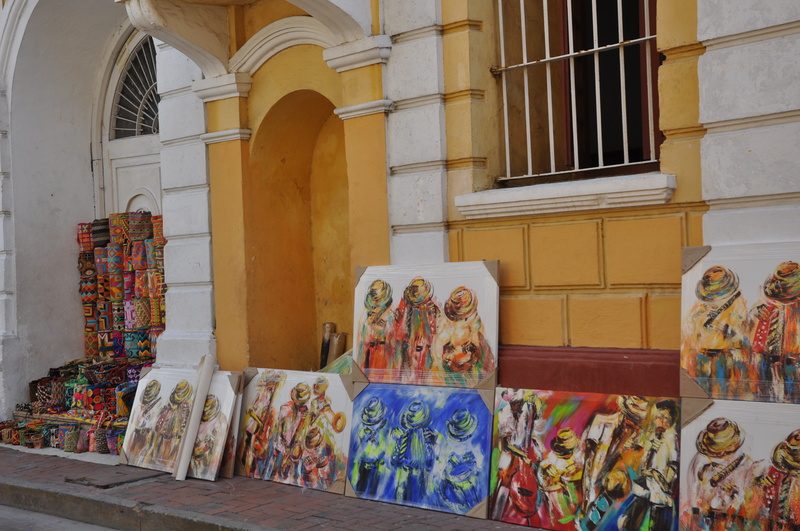 From the brightly hued buildings to the sculptures of Colombian heroes in just about every square, to the locally made necklaces and bags for sale on the sidewalks, there was plenty of eye candy to keep my entire family (including my three-year old son) intrigued each day. 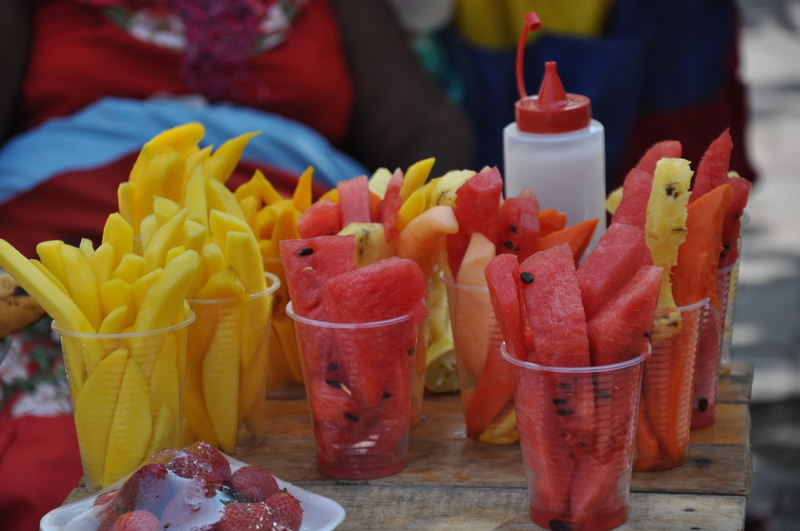 The Colombian people were incredibly friendly and the food was terrific. Colombia is known for its local seafood, especially ceviche. The weather was balmy and beautiful, although early afternoons tended to be a bit hot, which was the perfect excuse for our long, relaxing lunches. 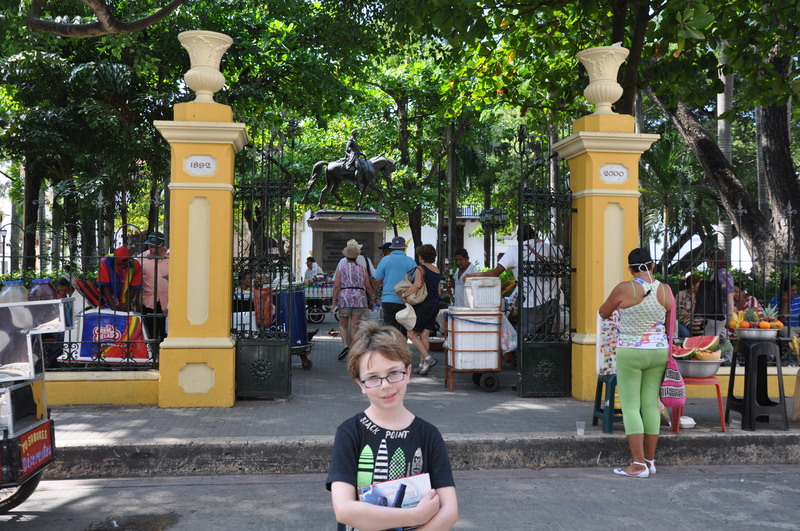 We took a slow pace and enjoyed taking in the culture of everyday life there so we did not get to as many of the “sites” as I would have liked…..but it was so fulfilling to just hit the pavement that we could not resist. See below for basic information and read on for details. 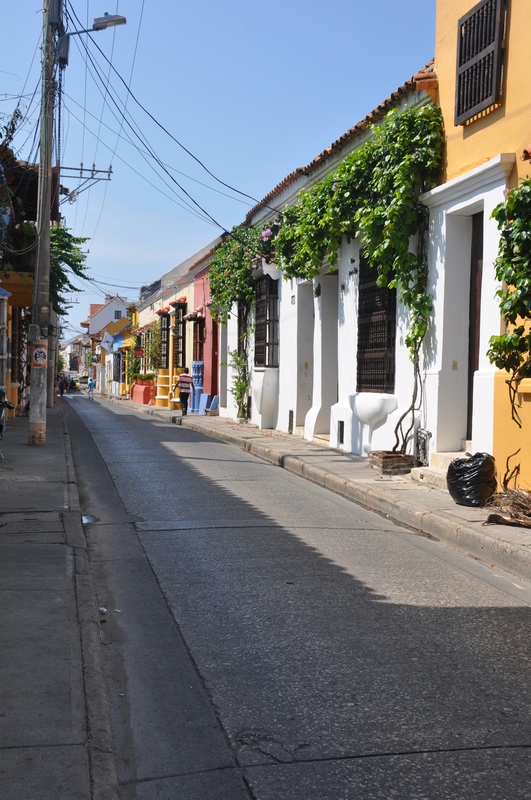 Airline – Jetblue non-stop from JFK to Cartagena. 5 1/2 hours down, 4 1/2 hours back. We arrived on a Tuesday afternoon to our hotel, the Hotel Santa Clara, which was originally built as a convent in the 1600’s. It is situated in a beautiful square that comes alive at night with star-shaped lights suspended from trees, cafés abuzz with outdoor dining and mariache-style musicians, and horse-and-chariots waiting to be hired. After a brief swim in the pool, we took the kids for a quick bite of dinner, settled them with a babysitter (hired through the hotel for all five nights – she was terrific) and headed out for delicious dinner at La Vitrola, an International restaurant that specializes in seafood and offers live music nightly. On Wednesday we explored the city by foot, discovering the beautiful architecture and artwork at just about every turn. Most streets were so charming I felt like I was on a film set (note: there were a few streets that were somewhat seedy, but we never really felt unsafe). 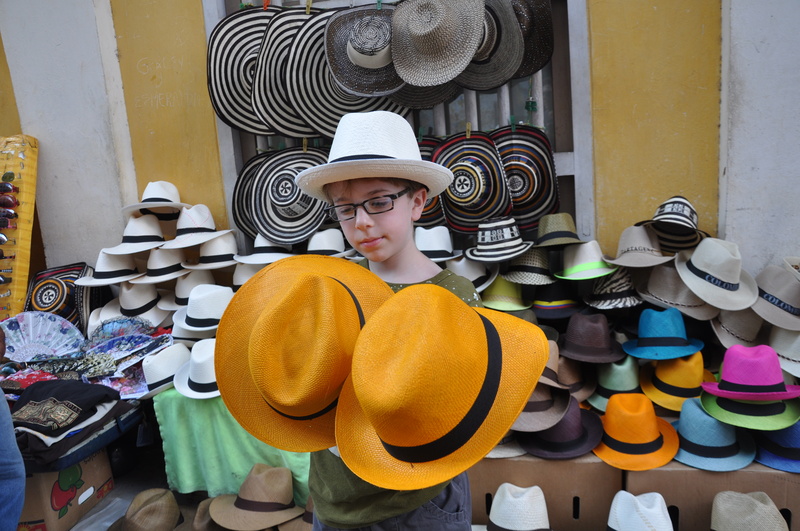 We were completely immersed in the street vendor culture that surrounded us, from artwork, to jewelry made by hand from beads, to handmade bags and Panama hats in every size and color. 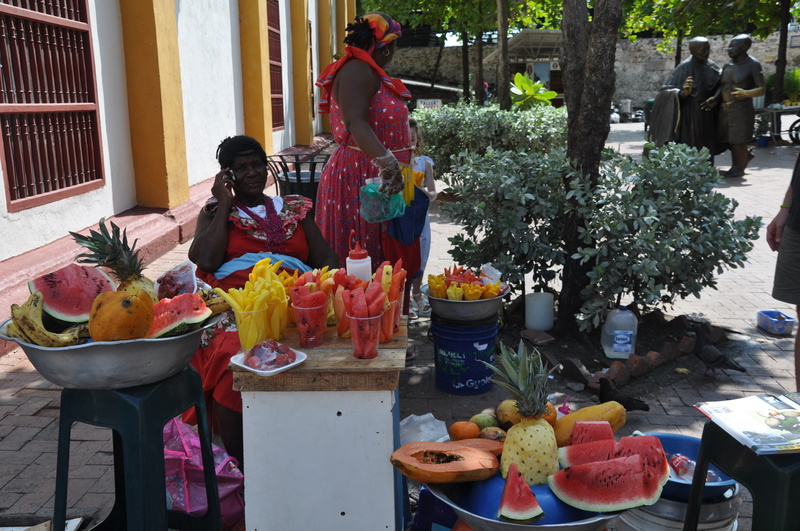 The watermelon and mangos sold on the streets were the sweetest I’ve ever tasted. 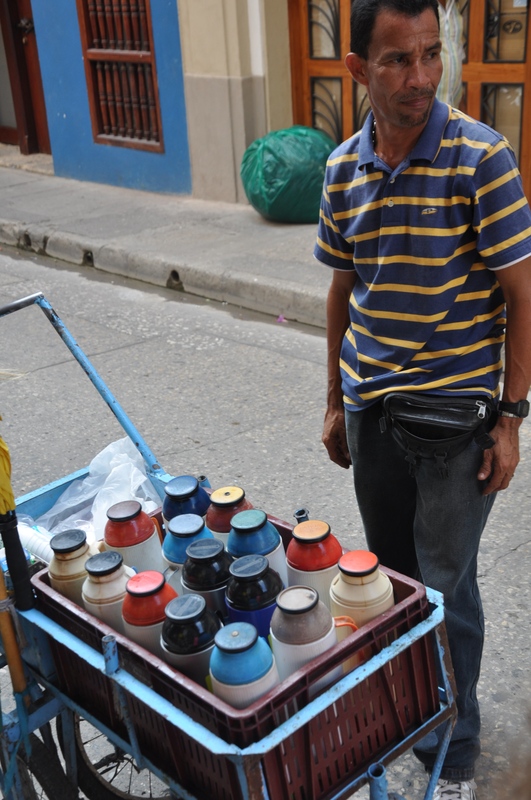 There were even men selling what my husband referred to as “Colombian Starbucks” on the street. They had gallon-sized containers with different types of coffee that they served in dixie cups. 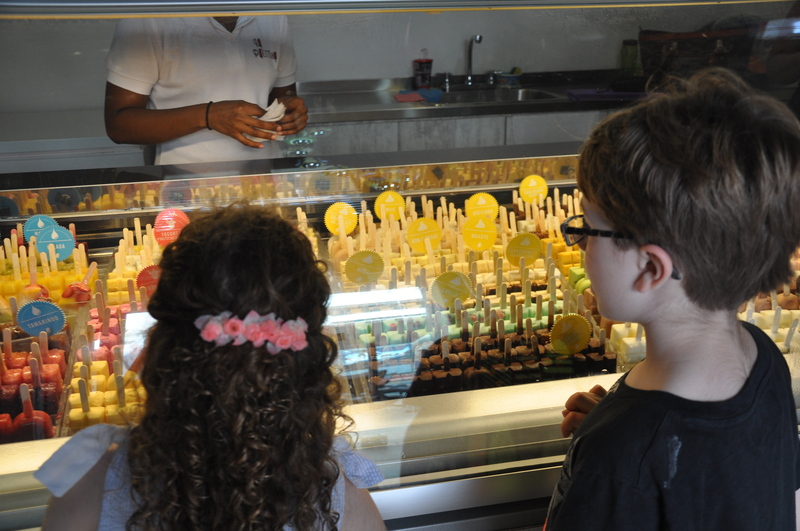 We had lunch at a very pretty restaurant called Don Juan ((http://www.donjuancartagena.com/), which serves Caribbean-inspired seafood, after which we stumbled upon a delicious gelato store called Gelateria Paradiso (http://gelateriaparadiso.co/) and ducked in for dessert (an equally deliclius “Paletteria” is right next door – artisanal ices and ice cream served on pops). That evening we went to a beautiful and delicious restaurant called Alma http://www.hotelcasasanagustin.com/alma-restaurant.php), in the Casa San Agustin Hotel. 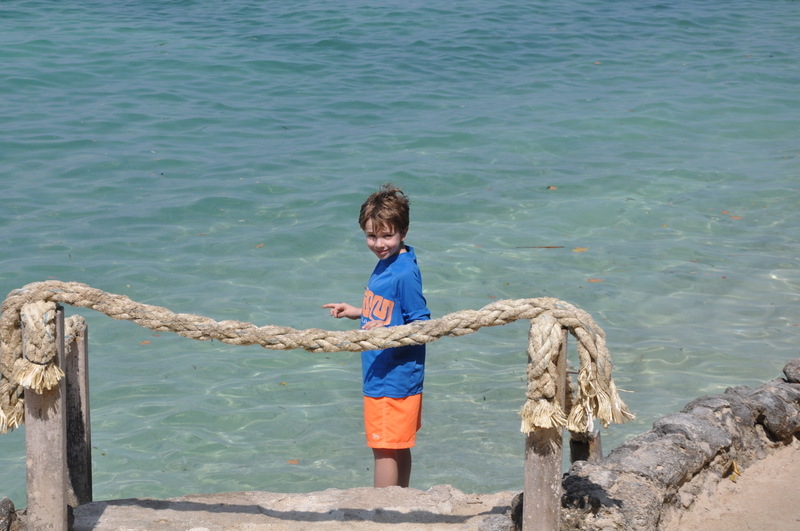 On Thursday we headed out to the Rosario Islands for the day, which is about an hour from Cartagena. 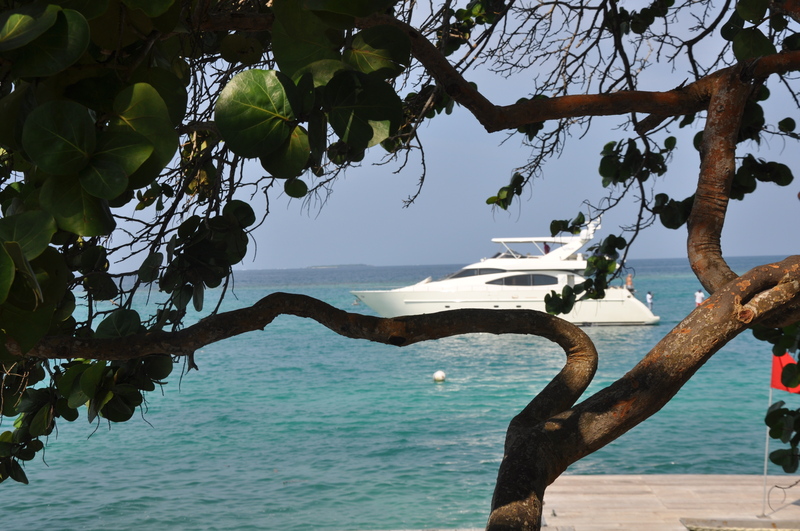 A friend of ours reserved a fully-equipped yacht to take us to a stunning area where we swam and relaxed on lounge chairs before heading back to the boat for fresh lobsters and fried plantains. What we saw of the island was beautiful, with a well-preserved natural landscape. I only wish we had had more time to explore because there were foot paths beckoning us. There is an aquarium there as well that I understand is worth a visit. 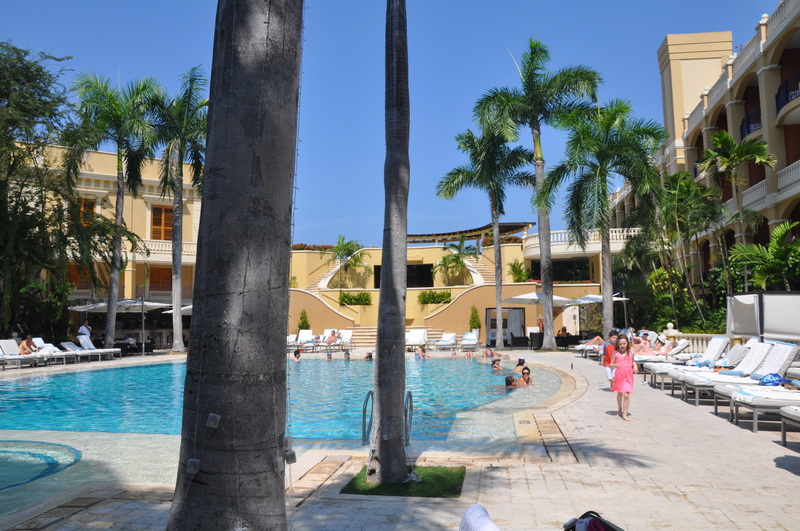 Next time I would love to spend a night or two on the island at the Hotel Majagua (http://www.hotelmajagua.com/en/). 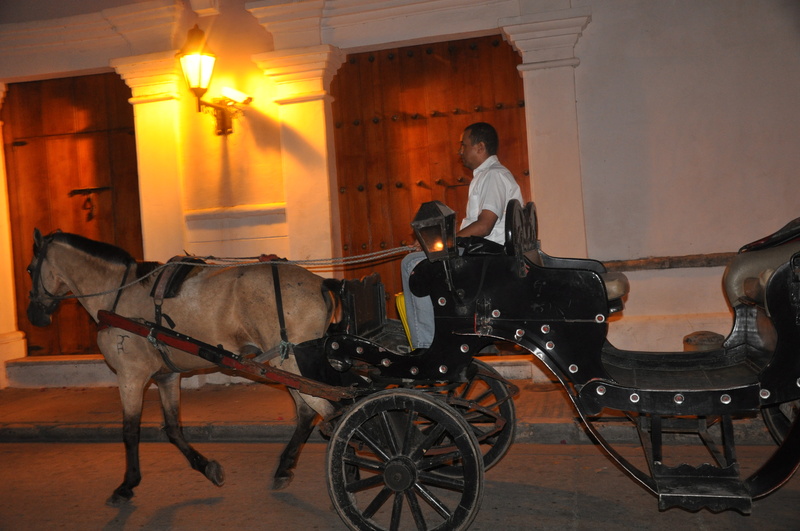 Shortly after arriving back at the hotel, we took the kids on a sunset horse-and-buggy ride through the colonial city, which made us all feel as if we were in a fairytale – any “flaws” were hidden under a night sky, and all of the beauty radiated through strategically placed lights and live Colombian music resounding through the streets. Later that evening we went to the rooftop terrace of the Movich Hotel (https://movichhotels.com/) for cocktails and dancing. 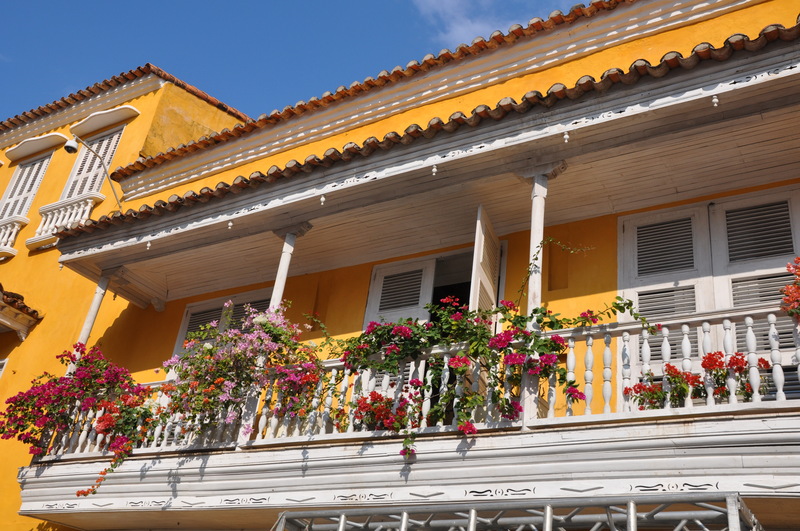 The Movich is a modern, boutique hotel (yes, they have them in Cartagena!) that is definitely worth a visit. As we sipped on dangerously delicious mojitos, we admired the views of the city around us. 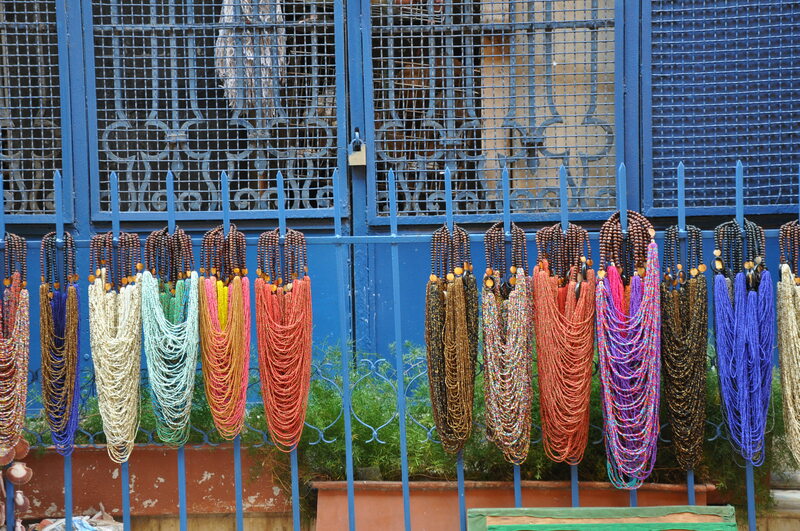 On Friday we took to the streets again, this time discovering another part of town. 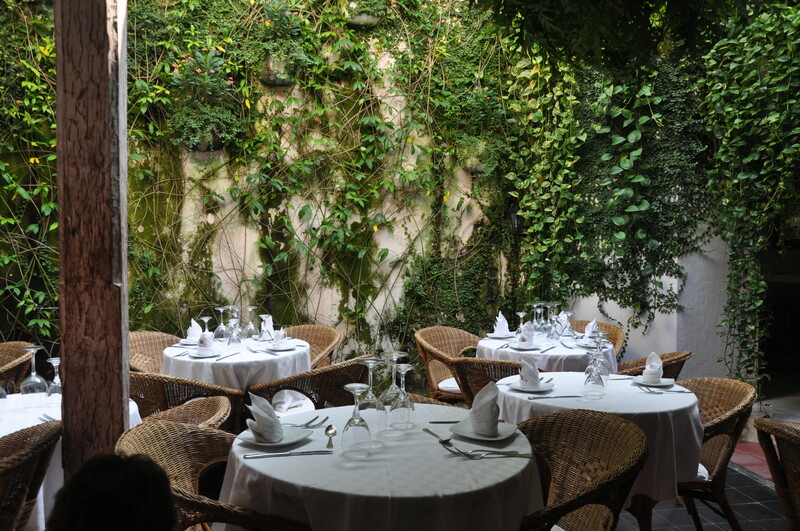 We then went for a terrific lunch at Cande´ (pictured below), which serves typical Colombian food. We feasted on local fish, coconut rice, plantains and ceviche. 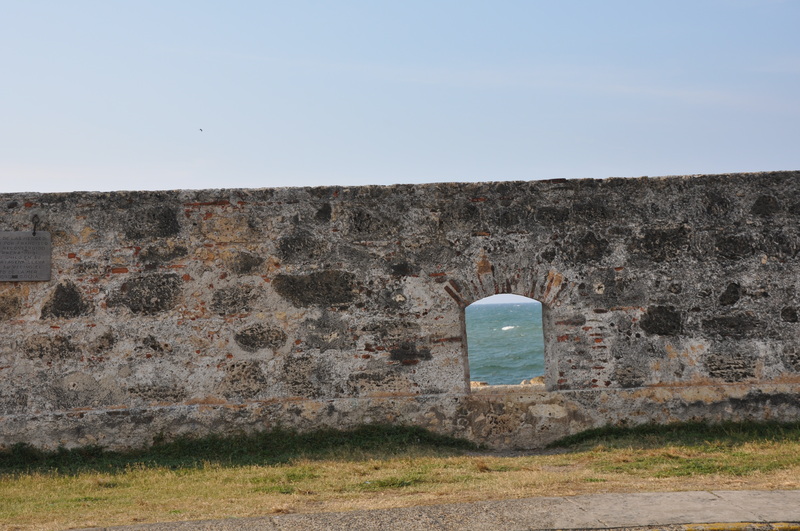 We then jumped into a taxi to visit the Castillo de San Felipe (http://www.colombiainfo.org/en-us/cities/cartagena/castillosanfelipedebarajas.aspx), which is about ten minutes outside of the walls of the old city. Besides being a critical historical site, it was a terrific place for the kids to run around and experience an “outdoor museum” in an interactive way. They climbed to the top of the castle, went inside old prison cells, climbed on cannons and echoed their way through tunnels. Additionally there is a series of underground tunnels that is worth exploring. 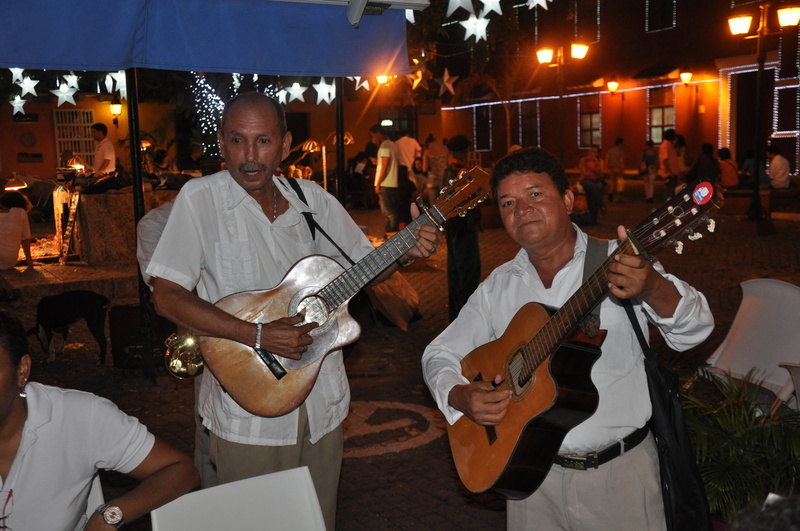 On Friday evening we went to Don Juan Restaurant (http://www.donjuancartagena.com/) again, this time for the rehearsal dinner for the wedding. It was excellent – I definitely recommend it for dinner over lunch. The owner also owns the restaurant next door, called Maria (http://www.mariacartagena.com/), which has a great reputation for cocktails and small plates. Our last full day was filled with wedding-related activities, but if we had the time, I would have loved to have visited the Museo de Arte Moderno (Museum of Modern Art), the Museo de Oro (Museum of Gold) and the Palace of the Inquisition, as well as some of the art galleries scattered about town, many of which looked very inviting. That’s okay, I have a feeling we’ll be back….. 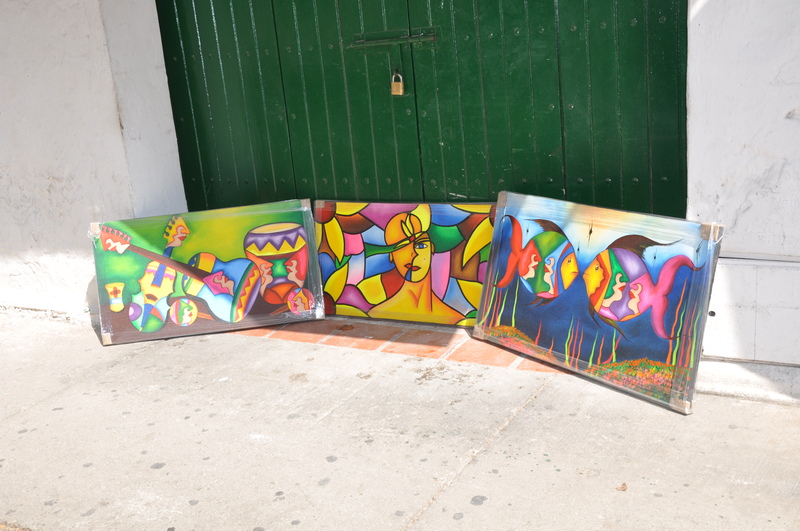 This entry was posted in Colombia and tagged Cartagena, Colombia by travelesq. Bookmark the permalink. Travelesq broke through with this sunny, breezy post which reflects the city it describes. Well-done travelesq and keep them coming. You make your journeys our journeys. Your #1 fan.